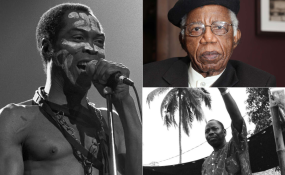 Musician Fela Anikulapo-Kuti, novelist Chinua Achebe and activist, Ken Saro-Wiwa. Nigeria, Africa's most populous nation and arguably its largest economy, is in electoral crisis following the 11th hour decision by the electoral commission to postpone polls due over the weekend. It's a good time to celebrate democracy - but also to ponder what has become of the country since it wrestled independence from colonial Britain in 1960. To do this, I find it helpful to consider what some of Nigeria's most celebrated cultural icons, among them musician, commentator and activist, Fela Anikulapo-Kuti - about whose political messaging I have written - the novelist Chinua Achebe and writer and activist, Ken Saro-Wiwa, might say about their country if they were alive today. Arguably, Nigeria has come a long way in the past few decades. There have been important, positive developments in the economy and, crucially for a nation of nearly 200 million people telecommunications. Yet it's still racked by corruption, dreadful health and education systems, and deep immorality among some who style themselves as custodians of religion and politics. These issues have long haunted the nation, and its cultural icons like Achebe, Fela and Saro-Wiwa were among those who highlighted Nigeria's failings in their work. And who could forget Ken Saro-Wiwa? He was an author, television producer and environmental activist, who led a campaign against the multinational petroleum industry in his home region, the Nigerian delta, which gave rise to severe environmental damage. On 10 November 1995, he was executed by the military dictatorship of Sani Abacha, for his [non-violent] campaign. I had the privilege to call him a friend and mentor when he was a contributor to Nigeria's Vanguard newspaper where I cut my teeth as a journalist. He also wrote a book, Sozaboy, and wittingly subtitled it A Novel in Rotten English. To many Nigerians, their country is rotten. It's like Saro-Wiwa's unintelligible tale told in rotten vernacular by a homeless prodigal son of unknown parentage, in a moment of insobriety in an unspecified city. Fela lived and died a committed political iconoclast and constant irritant to the political leadership in Nigeria... (but) Fela was not all about challenging political leadership. He also admonished his compatriots and Africans in general for being unassertive in the face of rampant systemic corruption, and not questioning their leaders' flagrant ineptitude and bad governance. In the lyrics of some of his songs, especially Mr Follow Follow, Zombie, Original Suffer Head, Authority Stealing, Shufering and Shmiling, Teacher Don't Teach Me Nonsense, Vagabonds in Power and Sorrow, Tears and Blood, Fela was critical of Nigerians who simply look on as their leaders squander their nation's fortunes. But, it's also true that Nigeria still has men and women of vision who are imbued with the fortitude, tenacity and assertiveness to redeem their country from the "Vagabonds in Power", as Fela labelled Nigeria's leaders of his era. The political messages in Fela's songs and lyrics are constant reminders about Nigeria's corrupt and lacklustre leadership. He was unequivocal that Nigerians could not realistically outsource the solution to their problems to the heavens. This, while they're haplessly "Shufering and Shmiling" in some expectation of divine intervention to free them from their predicament and misery. Nigeria, as Fela saw his country, should not be governed by political Zombie leaders forever. That was why he recommended that it was up to her citizens to rise and do something about this nonsense.